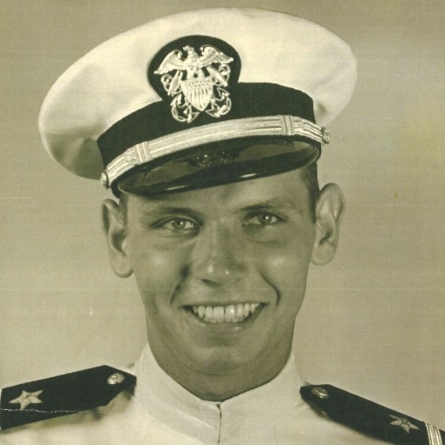 Robert P. Harper Jr., CDR, USN (Ret) – Born 1926 in Gallipolis, Ohio, Mr. Harper joined the Navy in 1945 as an enlisted member. He went to Penn State and studied Aeronautical Engineering, as part of a program called the Navy V-12 College Training Program. This program, where he made straight A’s, was designed to allow members to attend college, earn their degrees, and become Naval Officers. After completion of the program and upon being commissioned, he was transferred to Rhode Island. When he reported in, a LTJG informed him that he was going to be a "Deck Hand." Mr. Harper was extremely upset over this and let them know he wasn’t supposed to be a Deck Hand -- he was supposed to fly aircraft. Well, I guess he raised enough of a fuss because the next day he was shipped out to Navy Flight School. He liked to tell the story that during flight school; the instructor was impressed with how fast he caught on to everything. Mr. Harper already knew how to fly, but he kept that information to himself. Unfortunately, one of his classmates eventually told the instructor, getting him in trouble. He spent five months deployed aboard the USS KEARSARGE (CV-33) conducting flight ops off her wood deck in the North Atlantic, South Atlantic, and the Mediterranean. After his return, he transferred to Rhode Island where he flew torpedo planes until he transferred to the Reserves in 1949. He spent his Reserve time in various aircraft, piston and jet fighters, and anti-submarine and early jet fighters, one of which is presently on display on the USS LEXINGTON (CV-16). Leaving active service, Mr. Harper completed his bachelor and master’s degrees at MIT with Honors. Due to his grades, he was sought out by several large aerospace companies. But instead he decided on a small non-profit aeronautical research firm in Buffalo, NY -- Cornell Aeronautical Laboratory (CAL, now CALSPAN). He became one of the company's first engineering test pilots, and worked there until his retirement in 1992. He is best known for co-authoring the Cooper-Harper Rating scale used by test pilots worldwide. He frequently taught at both the Navy and Airforce Test Pilot Schools and was involved in the development of virtually every military aircraft developed until he retired, the last being the B-2 Stealth Bomber. As a Fellow in the Society of Experimental Test Pilots (SETP), he remained an active mentor to other test pilots and engineers until five years ago. Mr. Harper and his wife Dorothy retired to Corpus Christi, TX to be nearer their children and grandchildren and pursue his love of sailing. He was much loved by anyone who knew him. Many called him “dad”. He is survived by his wife of 69 years, two daughters, a son, five grandchildren and seven great-grandchildren. A Funeral Service will be held at 12:00 p.m. on Thursday, August 30, 2018 at All Saints Episcopal Church, 3026 South Staples in Corpus Christi, TX. Interment will follow at Coastal Bend State Veterans Cemetery, 9974 IH37 Access Rd, also in Corpus Christi, TX. In lieu of flowers, memorial contributions may be made to All Saints' Episcopal Church -- Memorial Fund, 3026 South Staples, and Corpus Christi, TX 78404.